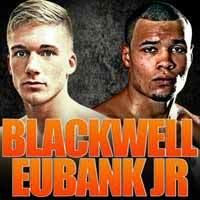 Review by AllTheBestFights.com: 2016-03-26, high pace with some nice combinations: Chris Eubank Jr vs Nick Blackwell is close to get four stars! The interim Wba champion Chris Eubank Jr entered this fight with a professional boxing record of 21-1-0 (16 KOs=76%) and he is ranked as the No.9 middleweight in the world (currently the #1 in this division is Saul ‘Canelo’ Alvarez). He suffered his only loss when he faced Billy Joe Saunders in 2014 (=Saunders vs Eubank Jr), after this bout he has won three fights beating Gary O’Sullivan in his last one (=Eubank Jr vs O’Sullivan). His opponent, Nick Blackwell, has an official record of 19-3-1 (8 knockouts) and he entered as the No.21 in the same weight class. He lost to Max Bursak in 2013 but since then he has collected six victories and one draw; he beat Jack Arnfield in his last bout (=Blackwell vs Arnfield). Eubank vs Blackwell is valid for the BBBofC British middleweight title. Watch the video and rate this fight!